← Delicious French style Chicken, walnut and Apple Baguette. 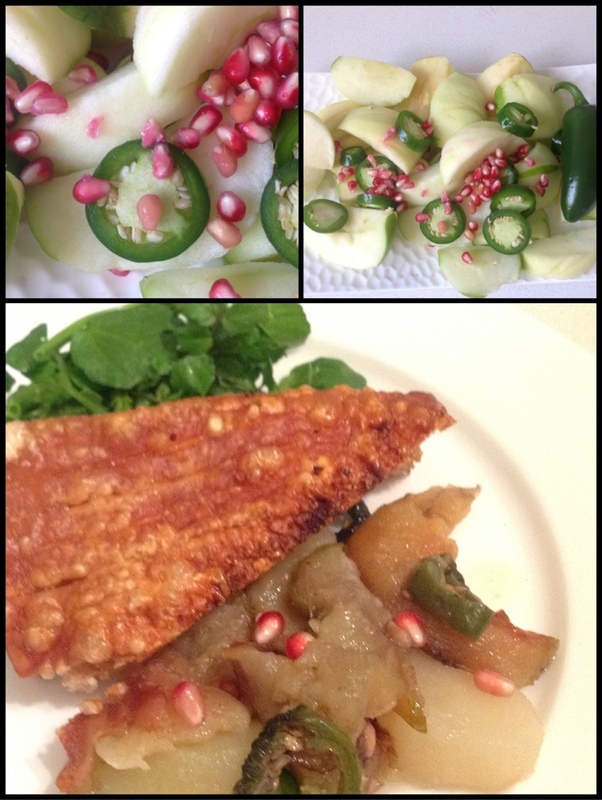 Roast pork belly w apple, jalapeño and pomegranate! With this sudden cold snap I felt like slow roasting something in the oven. Roast your pork belly resting on a bed of peeled chopped apple, chopped jalapeño, pomegranate and spring onion. The Pork roasts on top of the apple and Jalapenos so they get infused with the juices of the pork so you get this amazing, sweet spicy apple to compliment the Pork. Yummy! To start prepare your pork belly by scoring the rind. You can do straight lines defining where you would like to slice or diamonds for extra crispness. Pour boiling water over the meat to bring the fat to the surface. Rub the rind with olive oil and rock salt. Line your baking tray with foil. Place your chopped apple, Pomegranate, Jalapenos, five spice and red wine vinegar on the foil and then pop your roast pork on top. Roll up the sides of the foil to create a roast pocket, Leave the rind uncovered for crispiness. This keeps the flavour and moisture in the pork and ensures your apples don’t burn. Bake this parcel for for 2 hours at around 220 degrees celcius. Check the apples after 40 minutes as some of the outside ones may cook faster than those stewing under the roast. Remove apples after 40 minutes once the have caramelised and set aside to serve with pork. After 2 hours rind should be golden brown and crispy. Let pork rest for 10 mins then serve with apples and a side of water cress! The water cress adds some green and the light peppery flavour compliments the salty pork and sweet apple. I went to the posh butcher, who had pork belly on special, then the organic grocer where they had comically large pomegranates, and had the idea for apple/pom pork belly on a whim. I did a search when I came home and your post is at the top of the results, and it looks perfect. Thanks for putting this up! Let me know how it went!! I will be making this again for Christmas I reckon!! It’s a nice change from the usual roast!